Mathematics is commonly viewed as a difficult subject. Yes, it is. Mathematics is also commonly viewed as a very abstract and theoretical school subject, not as a genuine part of our culture, and without much relevance to the “real world.” Yes, it is abstract. But this is the reason for its great impact to our daily life: it gives the theoretical framework for the design, and for the understanding of many aspects and domains of the modern world – which includes main Matheon research areas, such as medicine, transportation and communication networks, energy markets, or geometric design, computer graphics and all kinds of visualization. The presentation of mathematics as an abstract school subject without relevance for the world “out there” has major negative effects: Since the late 1990s, PISA and TIMSS studies have displayed and highlighted considerable deficits in the mathematical education in Germany, in particular at the gymnasium level. According to these studies, many German pupils seem to be able to master calculations in a satisfactory way, but their abilities to solve application oriented problems are below average. Moreover, as the mathematics taught at schools is not experienced as something interesting and attractive, pupils are not well-motivated. And, indeed, the mathematical knowledge acquired by the pupils at school is not sufficient for their orientation in the real world. And there also tend to be deficits in the mathematical education of students who enter universities in order to study Mathematics, Sciences, or Engineering. Matheon is set to make substantial contributions to improve this situation. Especially one key aspect is in our focus: The basic mathematics to be taught at schools – according to the curricula – is old and may be viewed as rather dry. Indeed, very little of what the pupils see or learn is new, and there are typically very few references to any current mathematical developments. This traditional way of mathematics education at school is also reflected in the public’s – mostly negative – view of this subject. Thus Matheon scientists are on the one hand – in the Education line – striving to make aspects of current application-oriented mathematical research available at schools. Little of this might fit into curricula, but there are diverse possibilities of presenting current mathematics, and the spirit of mathematical discovery, in extra-curricular presentations and events. 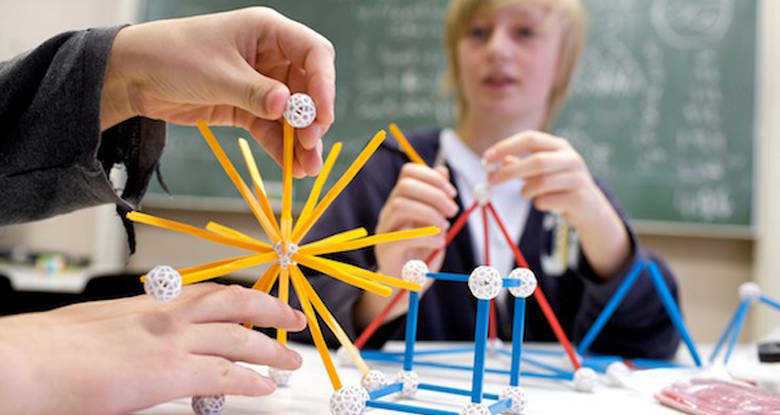 At the same time – in the Outreach line of activities – Matheon scientists address the public – which includes parents and teachers of school children – in a great variety of public presentations and activities. We want it to become clear that there are new mathematical discoveries made every day, that there is recent and current progress on many different questions. In the long run, the teaching of mathematics, including the corresponding mathematics curricula at schools and universities, have to become more attractive and problem-solving-oriented. For this, Matheon is working towards a closer cooperation between schools and universities than the present one.